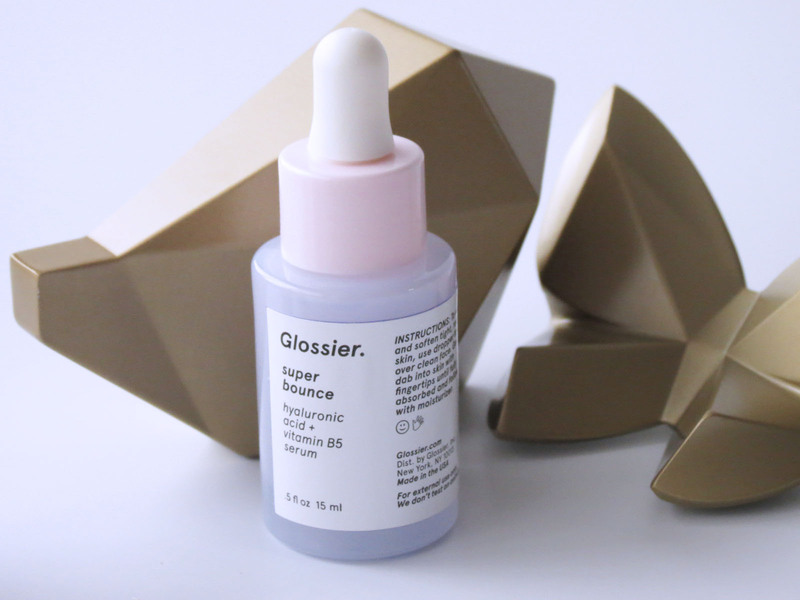 Glossier…. Aka the Holy Grail of skincare according to many. I’m sure this is not the first article you’ve read on the brand, God knows how many articles I’ve read on it, but still, I’d like to add in my 2 cents as well. 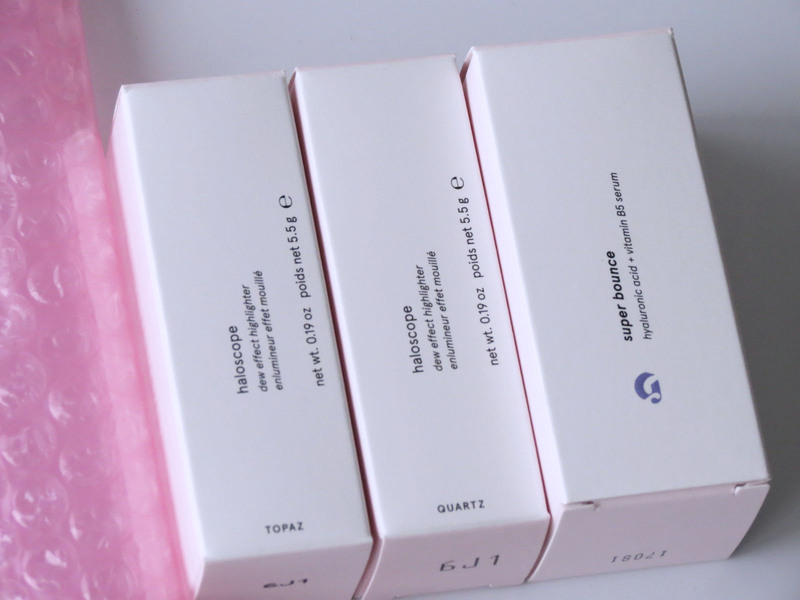 I couldn’t resist temptation any longer, and asked (no, pleaded) sweet Katia to bring me back some Glossier goodies when she hopped across the Atlantic to discover New York, and thanks to her being the amazing friend that she is, I finally got my mittens on some products. All in the name of blogging of course! 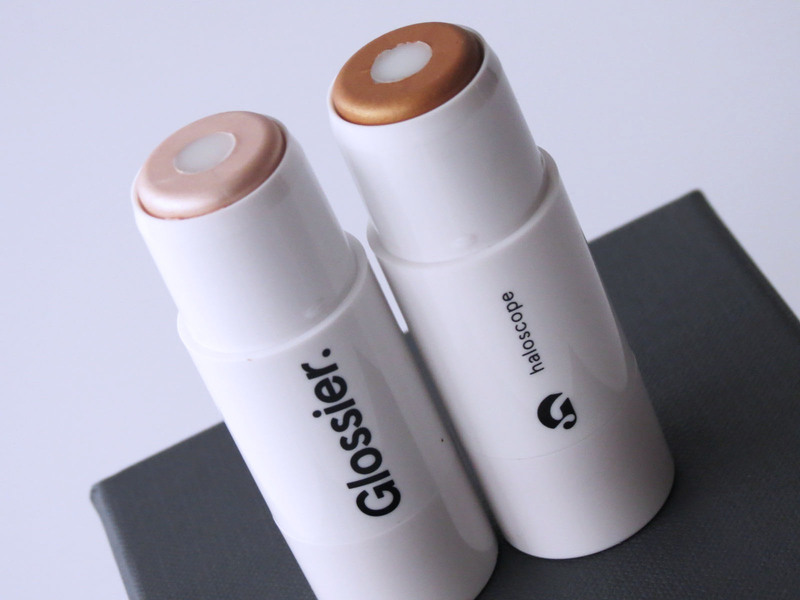 For those not aware who or what Glossier is (where have you been? ), it’s a beauty and skincare brand created by a super savvy woman (Emily Weiss) super savvy women who know what they want: Enhance what you’ve got and flaunt it, instead of hiding it. No frills, no faffing about, but luxury products that work for a price that doesn’t break the bank. 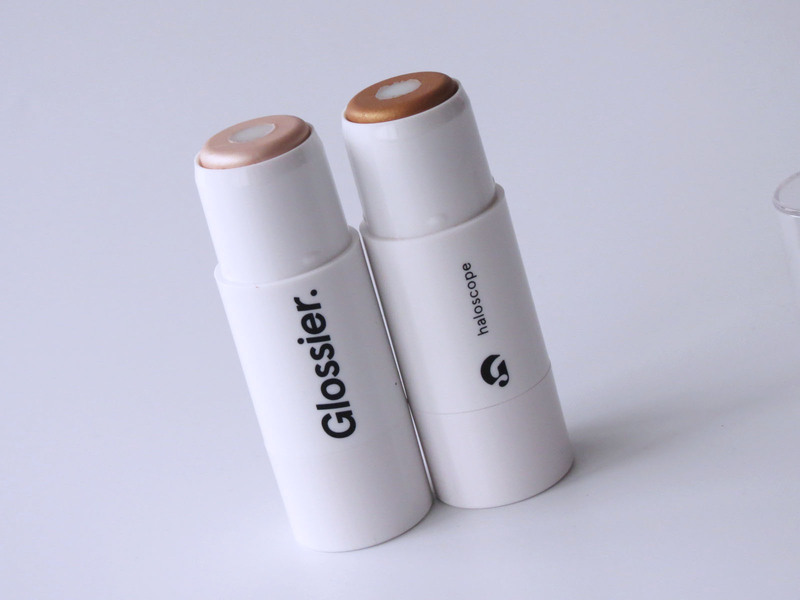 Add in smart packaging, formulas that work and a loyal millennial client base, and you can understand why Glossier is the beauty break-out star of the decade. And those pink pouches, oh those pink pouches! 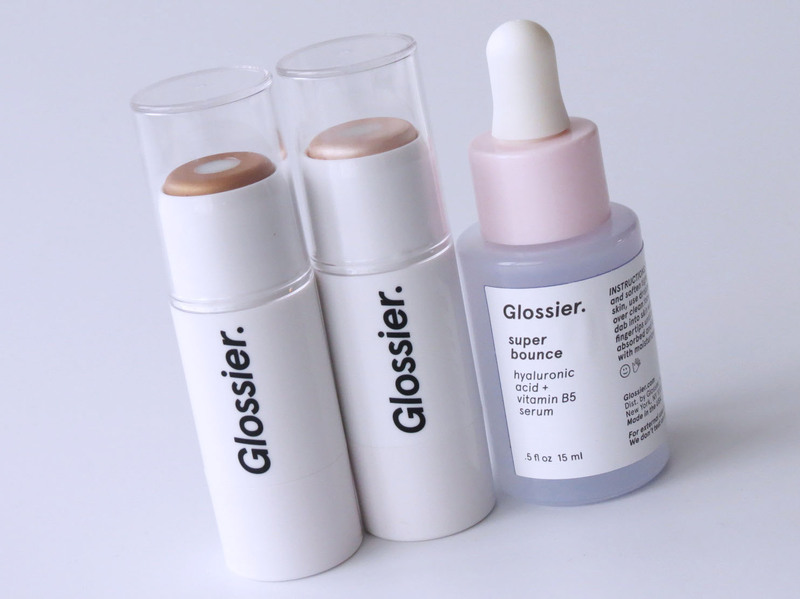 Not wanting to go overboard on my first order, I narrowed it down to three products, ie the Glossier Haloscope in Topaz and Quartz and the Balm Dotcom in Birthday. Of course, being the chaotic perfectionist that I am, I forgot to photograph the Balm Dotcom, but it’s worth mentioning nonetheless! After months of surviving on the Lucas’ Paw Paw Ointment, I was ready for something new, and the Balm Dotcom in Birthday proved to be just the ticket! Thick and creamy without being sticky or too much and far more soothing than I had expected. The shimmer is remarkably subtile, making it suitable for a day at the office. The only downside is that I have to keep myself fom licking my lips all the time, thanks to that gentle scent of pound cake and vanilla. Highlighters and I don’t really mix well, to say I am cack-handed at applying them is an understatement. However, I really love that natural lit-from-within, oil-on-the-cheekbones look, and I had an inkling that the Haloscope highlighters could be my cup of tea. And my cup of tea they were! It applies smoothly, the colour pay off is just dense enough, while the moisturizing core adds that dewiness that keeps it looking natural. Quartz adds a hint of pink that works better when I have a bit of a tan, but Topaz is the real winner here! The bronze-brown shade is a perfect companion to my complexion, warming it up and adding an oomph that I love! Savvy readers (that word really is linked to Glossier) will have noticed that there is a product in the pictures that I did not mention above… Katia, ever the enabler, knows what USP’s sing to me and absolutely insisted that I’d try the Super Bounce serum to inject some exra moisture in my morning routine. Spoiler alert, it really is super! 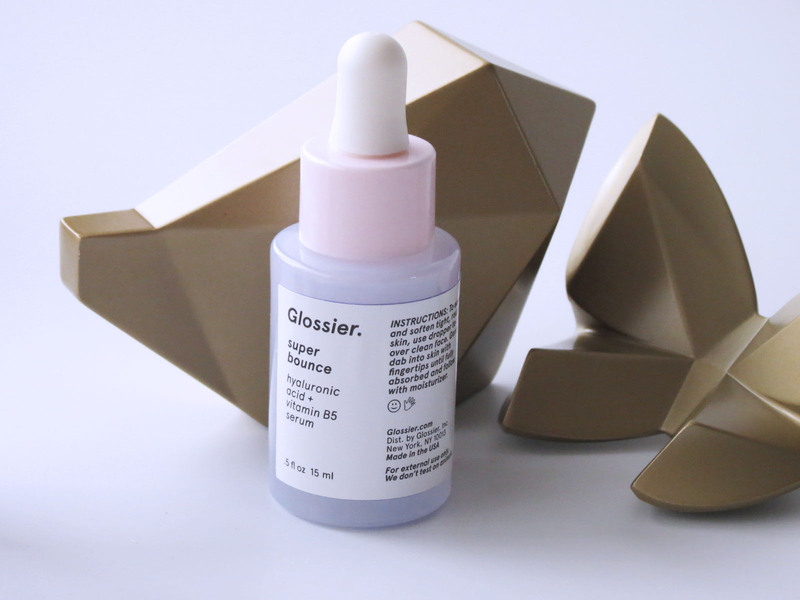 More on the watery side, this very liquid serum is very much loved by me and my skin, and I am readdy to go into panick mode because I am almost out of it! 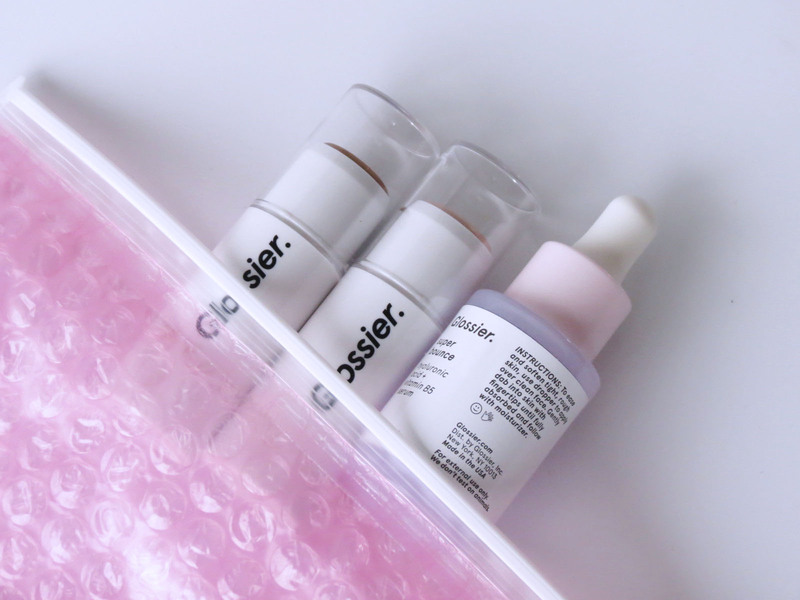 Glossier, how about shipping to continental Europe?